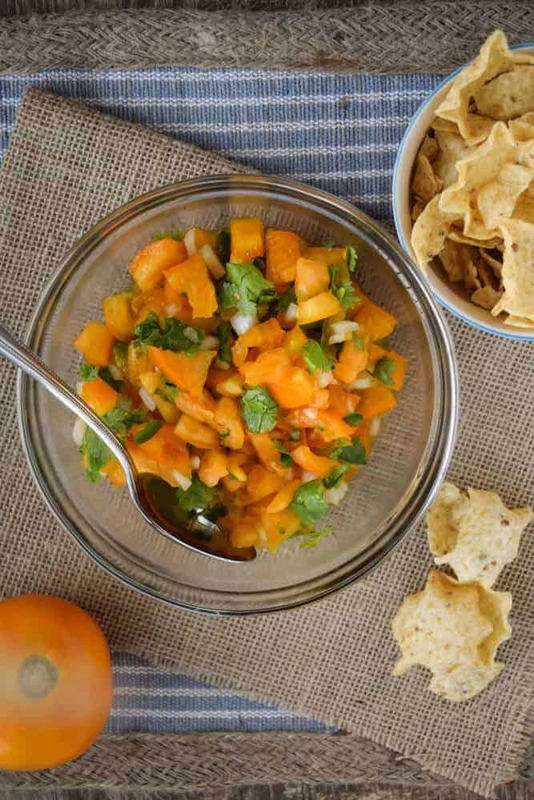 This Sunny Pico De Gallo is so summery and fresh! 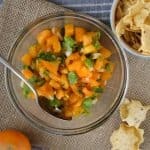 It’s the perfect accompaniment to your favorite tortilla chips, quesadillas or fajitas. It’s super simple to make with only five ingredients. This is so much better than what you can buy in the store and only takes 10 minutes to throw together. Are you sold yet? I make a big batch and keep it in the fridge for about three days. Any longer and it gets soggy. It is delicious on scrambled eggs or with turkey and avocado for lunch. It’s a great side dish with these Easy Five Ingredient Chicken Legs and rice. 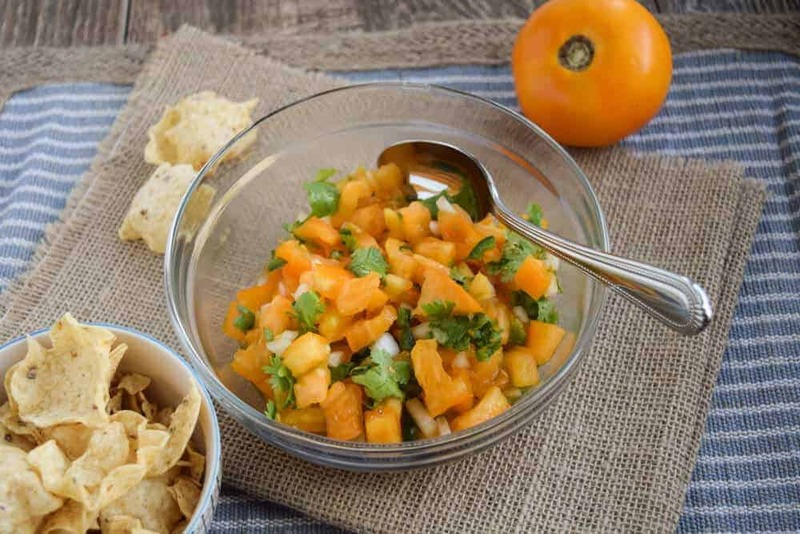 The real trick to making the perfect pico de gallo is in the tomatoes. You will not get good pico without good tomatoes. I like to choose tomatoes that are firm and ripe – not overripe or they will be too soft. When preparing your tomatoes you must seed them to cut down on the liquid. Here’s a great link to show you how. Basically, I sliced them in half along the equator and squeezed them over a bowl. Easy peasy! Alternately some folks like to dice them, salt them and let them drain over a fine mesh sieve. Pick you favorite and get to it. Sunny and fresh pico de gallo. Mix all ingredients together in a small bowl. Toss to combine. 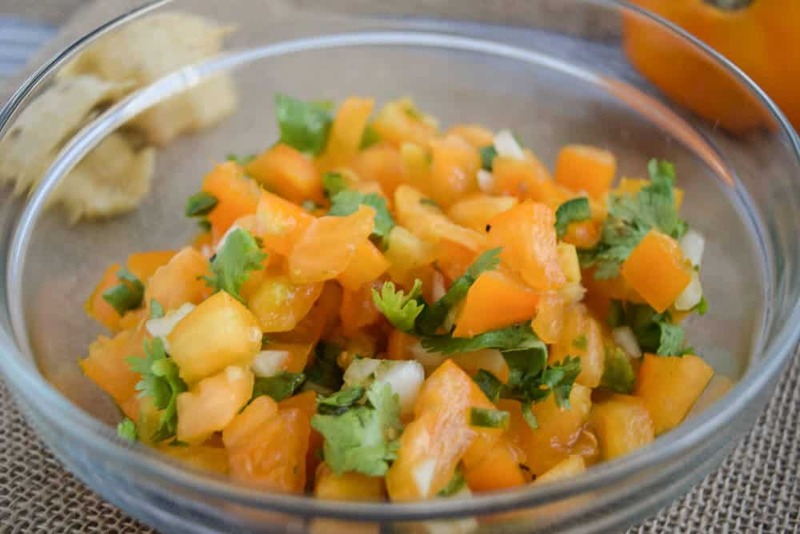 Serve this Sunny Pico De Gallo With Yellow Tomatoes. Serve this Sunny Pico De Gallo With Yellow Tomatoes alongside this Herbed Skirt Steak.